Home Court | ASET Services, Inc. The links below lead to pages which introduce each of our main service areas. From there you’ll be able to explore each topic in more detail. However, you may want to visit our services overview to gain a general idea of the services that ASET provides. 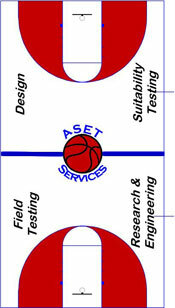 ASET offers a variety of testing services to the entire sports surface industry from manufacturers to architects to individual facilities. Testing services are customized based on each client’s needs. ASET’s inspection services can estimate damage to gymnasiums and other surfaces due to flooding, and verify that repairs deliver the appropriate performance. ASET offers a variety of engineering services including; 3-D and 2-D CAD models and drawings, finite element analysis, rigid-body kinematics, and stand alone test software. ASET’s research programs are customized to provide necessary data and analysis. Our academic and research background allow us to help manufacturers and architects innovate, investigate, and validate sports surface claims. Visit this area to access a wide range of free resource and educational information relating to sports, sport surfaces, and biomechanics. The library provides links to sports surface manufacturers, industry trade groups, as well as biomechanics and injury prevention. ASET also develops customized education programs for manufacturers who are introducing new products or concepts to the marketplace, as well as for facilities who want to obtain a sport surface knowledge foundation before speaking with manufacturers or installers.